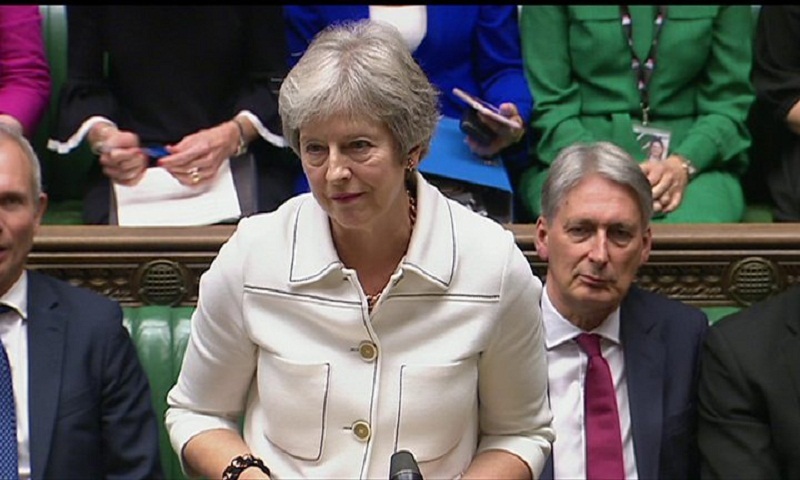 Prime Minister Theresa May has called for “cool, calm heads” as she insisted a Brexit deal was “still achievable” despite differences with the EU. She said it was “frustrating” the two sides could not agree how to guarantee no hard border in Northern Ireland. The issue could not “derail” the chances of striking a deal, she said. And she sought to reassure critics of her approach that the UK would not end up in “permanent limbo” tied to EU customs rules. Meanwhile, ahead of a crunch summit of European leaders this week, German Chancellor Angela Merkel warned a deal was looking “more difficult” because of the border question. “If it doesn’t work out this week, we must continue negotiating, that is clear – but time is pressing,” she added. And Donald Tusk, the president of the European Council, urged both sides not to give up, suggesting a deal “always seems impossible until it is done”. In the Commons, Mrs May faced pressure from both sides of the Brexit debate as she gave a statement to MPs. Brexiteers warned of the UK being tied to EU rules, Remainers called for another referendum and the Democratic Unionist Party – which gives the Tories support in key votes – demanded no separate arrangements for Northern Ireland. Jeremy Corbyn said Mrs May should make way for Labour rather than be “buffeted this way and that way by the chaos of her own party”. Unscheduled talks with the EU on Sunday broke up over the Irish border issue with just days left before the summit, which begins on Wednesday. Mrs May has dismissed the EU’s previous suggestion of keeping Northern Ireland aligned to its trade rules as a safety net, or “backstop” to avoid a hard border, saying this would divide the UK. She told MPs the EU had “responded positively” to her proposal for a UK-wide arrangement – but that it was insisting on keeping a specific arrangement for Northern Ireland on the table. Some Brexiteers are unhappy at the prospect of the UK staying inside the EU’s customs regime beyond the proposed transition period, which will end in December 2020. “I need to be able to look the British people in the eye and say this backstop is a temporary solution,” Mrs May told MPs, seeking to assure critics it would not become “permanent limbo”. But Mrs May has said this would undermine the integrity of the UK, by creating a new border in the Irish Sea. But the EU says a backstop would not work if it is time-limited. Some Tory Brexiteers say the backstop is not necessary at all because technological solutions can avoid a hard border. Theresa May will chair her weekly cabinet meeting on Tuesday, which is likely to be dominated by Brexit. The prime minister has been invited to address EU leaders over dinner on Wednesday amid unconfirmed media reports that she has been given 48 hours to show she can muster domestic support for a Brexit deal. The remaining 27 EU members will then meet, without the UK, to decide how to take the negotiations forward. They are expected to decide whether there is enough progress to go ahead with a special summit in the middle of November, and whether this will focus on doing the deal itself or planning for no deal. In his letter to EU leaders, Mr Tusk said a no-deal scenario was “more likely than ever before” but the EU’s mindset must be to “make every effort” to reach a consensus.